Socks from stash club: A wee bit Behind....but picking up the pace! A wee bit Behind....but picking up the pace! Okay, so these were SUPPOSED to be my February socks and they were SUPPOSED to have cables in them..but, well it didn't quite happen that way!! My DH wanted a pair of socks and I caved ( he claimed that I NEVER knit for him...guilt took a hold of me) So the gray cabled socks that I intended became regular beautiful gray socks. HE adores them!!! 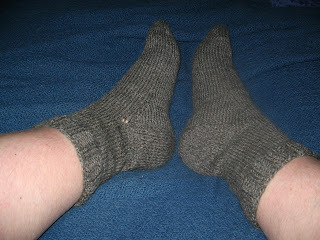 I knit them toe-up out of Paton's Kroy Sock yarn. I owe alot of guilt trip socks and other knitting gifts. LOL. Great job! A Jumpstart on April Socks..